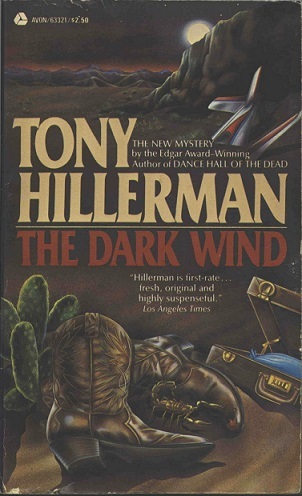 This is the first paperback edition of The Dark Wind published by Avon Books. The cover art by Susan Hull depicts a plane crash in the background and a prickly pear cactus, a pair of cowboy boots, a scorpion, and a filled suitcase in the foreground. All of these elements, save the scorpion, are key plot elements. Contents: [i] brief description, [ii] Other Avon Books by Tony Hillerman, [iii] title, [iv] imprint and copyright, [v] dedication, [vi] blank, [vii] AUTHOR'S NOTES, [viii] blank, 1-214 text, [215-216], advertisements. Format: Paperback; 17.4 x10.7 cm.